I am proud to announce that Adrian from Little Plastic Man had finished the first ever OTTi Paper Toy! "I see OTTi as a cheeky, fun and willing to do anything for a laugh kind of guy, hence I decided to ask him to bare it all!!" And he is not far from the truth about OTTi. 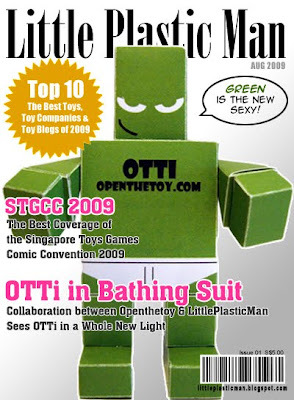 More of OTTi will be revile next month here on Openthetoy. Nice cool dude! I like the magazine style pic too!